Have You Considered A Complete Environment Controller? 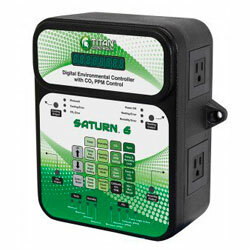 Easily manage and control your CO2 as well as your fan, dehumidifier, and more with the Titan Controls Saturn 6: Temperature, Humidity and CO2 Controller and others! Carbon dioxide (CO2) is an essential compound in the grow room. CO2 is a byproduct of photosynthesis, and when used properly, can supercharge growth and result in a heavier harvest! What does CO2 do in the grow room? Adding CO2 into the grow room can have profound effects, but only when used correctly. CO2 helps plants absorb light, and when you are using powerful grow lighting such as MH and HPS lights, CMH lights, or LED lights, the results can be astounding. However, if you are using less powerful lights in your grow tent or grow room, such as fluorescent grow lights, additional CO2 will not have as much of an effect. If your grow lights are powerful enough, plants can benefit greatly from CO2 levels of 1,200-2,000 ppm. How do you add CO2 in the grow room? 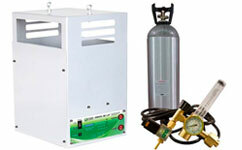 The two main ways of introducing CO2 into the grow room are CO2 burners and CO2 tank and regulator kits. CO2 burners will use either liquid propane or natural gas to create CO2, and are known for creating a lot of heat, so they are best used in larger grow rooms or greenhouses. If you do use one in a smaller growing space, be sure you have adequate air conditioning! CO2 tank and regulator kits emit less heat, and thus are the better option for some growing spaces. These tanks are refillable, and it is usually easy to find a place to fill the tank. If you have a multi-function grow room controller for the other components in your grow room, this will be able to control your CO2. Otherwise, you will need a CO2 controller. These controllers keep CO2 levels at the optimal range, and turn them off CO2 producing devices when the lights are off (since plants cannot use CO2 without light). The best CO2 controllers will have photocell, which allows for easy synchronization of grow light schedules and devices that operate on the same schedule as grow lights (fans, CO2 devices). Some controllers have an integrated CO2 sensor, and others have a remote CO2 sensor. The CO2 sensor is what measures CO2 levels in the air. The only difference is whether the controller houses the sensor, or if the sensor is connected to the controller and located elsewhere. Most of these controllers feature a standard standard 120 Volt supply, and are single zone. If you want to learn more about controlling the atmosphere in your grow room, check out our full guide on grow room automation! Unsure which controller is best for you? Give our expert growers a call at 888-815-9763 and let us help you decide!